You can use any kind of prawns or shrimp you like. If you have fresh ones, you'll need to remove the heads, tails and shell, and also de-vein them. If using frozen ones, they'll need to be defrosted. Using a stick blender, make a puree of the prawns, salt and any other seasoning you are using. Get it as smooth as you can. In this recipe I'm using fish sauce to give a strong umami flavour - you can experiment with other things like oyster sauce, chilli, garlic - whatever takes your fancy. Mix the prawn paste with the tapioca flour. You may need to add a small amount of water to bring it together, but be careful not to add too much - you want a stiff, dry dough. Roll the dough into a thick sausage - plastic film will help you form a regular shape. Put the sausage in the fridge to firm up for half an hour. Remove the plastic film and steam the sausage for an hour or longer, until it is cooked all the way through. Chill the sausage in the fridge. About 30 minutes before you want to slice it, place it in the freezer to solidify but not freeze. You need to slice the sausage into the thinnest possible wafers you can. Place the wafers on a wire or mesh rack. Now you need them to dry out completely - you can do this by leaving them (covered) to air-dry for a few days, or put them in a low oven for a few hours, turning frequently. When fully dry, they should be brittle and snap easily. Pour about 50cm (2 inches) of oil into a wok or deep frying pan. Heat the oil to 190°C (374°F). Add the wafers in batches. They will sink to the bottom and then float to the top and puff open. As soon as they are puffed up, remove them from the oil and drain them on kitchen paper. The video above is from the Keef Cooks YouTube channel. 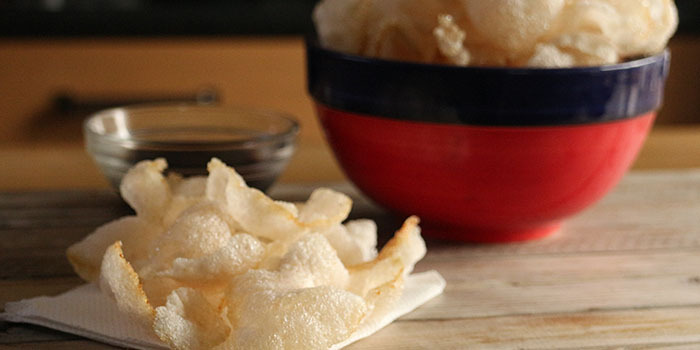 Click here to see the video recipe of Prawn Crackers on YouTube. NOTE: tapioca flour is processed from the root of the cassava plant. It's the only kind of flour that will give the proper puffiness when frying. You can get it from Chinese or SE Asian stores. Prep time: 30 minutes. Drying time: 24 hours. Cooking time: 1 hours 5 minutes. Total time: 25 hours 35 minutes.